INTRODUCING THE AMAZING FLASH PAD' DEFECTS REMOVED IN ONE PASS! Polishing Face Diameter: 6 1/4? Hook & Loop Diameter: 5 7/8? CARPRO FLASH PAD 5" INTRODUCING THE AMAZING FLASH PAD' DEFECTS REMOVED IN ONE PASS! PROFESSIONAL DETAILERS CONTACT US FOR SPECIAL PRICING The Flash pad was specifically designed to provide instant defect removal! The unique polyurethane foam allows you to easily remove heavy defects and powers through overspray, bird droppings, severe scratches, and almost any other type of marking that can be found on a painted surface. The beveled profile allows the face of the pad to contour out away from the backing plate providing an extra level of precaution around tight spots. While the performance is stunning, the lifespan of the Flash Pad was not compromised in the design of this amazing tool. 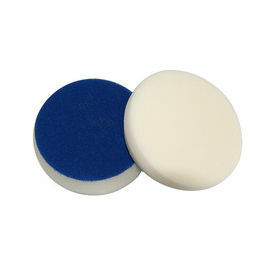 They are in fact extremely durable and have been proven to last twice as long as other pads on the market! Manufactured in France, the CarPro Flash Pad is made of a unique aggressive reticulated polyurethane foam which cuts through defects in a flash! Incredibly it accomplishes this heavy defect removal without leaving behind holograms. Armed with only a Dual Action machine the amazing Flash Pad is capable of providing more cut than a typical rotary polisher setup and finishes down much better! Features: Extreme Cut! Extremely Durable Reticulated Polyurethane Foam Bevel profile High Grade adhesive backing Velcro backing Specifications: Made in: France Material: Reticulated Polyurethane Polishing Face Diameter: 6 1/4? Hook & Loop Diameter: 5 7/8? Thickness: 3/4? Color: Cream Velcro Color: Royal Blue Velcro Peel Strength (Dry) N/25mm: 16 Velcro Peel Strength (Wet) N/25mm: 13 Tensile Strength: 330 kPa Ultimate Elongation: 135% Cell Count: 73 ppi Density kg/m3: 37 Cut: 8/8 Intense Finish: 6/8 Good Polishing Tips: Fasten pad to machine taking care to securely center it on your backing plate Follow polish dependant tips Avoid overworking an area and do not hold pad still in one place When polishing, clean your pad after each section with your Foam Pad Brush before applying a couple more drops of polish for the next section.